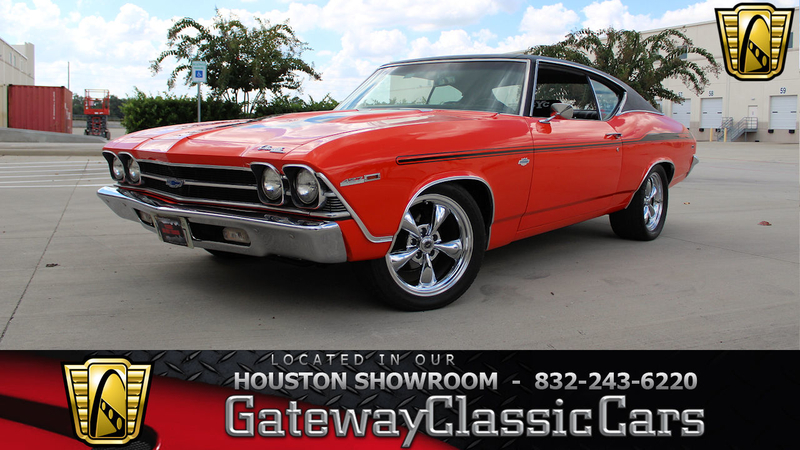 General description : Now for sale in our Houston Showroom is this awesome tribute to one of the true American muscle cars, the 1969 Chevrolet Chevelle Yenko SC. Bathed in its original shade of Hugger Orange (color code 72), this Yenko Tribute has been assembled to mirror a Chevrolet COPO 9737 option "Yenko Sports Cars" build (of which only 99 were manufactured in 1969); but this one has some very desirable modern enhancements. With only 400 miles on it since the engine build was completed, this beast is powered by a professionally-built and balanced 427 CID big block V8, complete with 840 rectangular port heads, and a Comp Cams roller cam (11-602-13) with roller lifters and rockers. Electronic ignition fires off the go-juice supplied by the brand-new Holley HP Electronic Fuel Injection, so this beast is daily-driver capable, thanks to the tractability provided by its fully-tunable modern fuel injection system. A new 4 core radiator helps keep engine temps in check while coated Hedman headers direct the spent fossils through its custom dual exhaust system, adding to the deep rumble of this cammed big block, and making this Yenko Tribute for sale sound as nasty as it looks. Coupled to a Muncie 4 speed manual with Hurst shifter, this baby gets the power to the ground NOW. Hooking up is no problem, thanks to the beefy 315/35-ZR17 Nitto 555 radials out back. Inside, the factory gauges keep the driver informed during cockpit operations, and a custom stereo system with AM/FM/CD player and Bluetooth send the tunes pumping out through custom kick panel and parcel shelf speakers, which are further enhanced by the trunk-mounted subwoofer. Bucket seats up front and a rear bench seat give you the chance to take the whole family out to car meets, or run a crew to the racetrack. On the way, the Vintage Air A/C keeps the occupants' climate comfortable, and the newly-rebuilt front suspension, complete with coil-over shocks keep all four tires' contact patches square to the pavement. Other additional features and options on this 1969 Chevrolet Chevelle for sale include A/C, Aluminum Alloy Wheels, AM/FM/CD Radio with Bluetooth, new Floor Mats, a new Fuel Tank, Performance Radial Tires, Power Brakes, Power Steering, Seat Belts, a new Serpentine Belt accessory drive system, and Vinyl Interior. For more information on this 1969 Chevrolet Chevelle "Yenko Tribute" for sale, to see all the HD pictures and videos of it, copy the URL below, and see it at this direct link: http://www.gatewayclassiccars.com/show/HOU/1354 . Alternatively, if you want to see it in person, come to our Houston Showroom, located at 1910 Cypress Station Dr, Bldg 200, Houston, TX 77090. You may also call the showroom at (832) 243-6220, or email us at Houston@gatewayclassiccars.com. 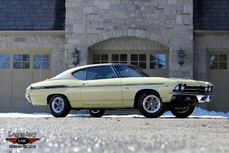 1969 Chevrolet Chevelle is listed for sale on ClassicDigest in Houston by Gateway Classic Cars - Houston for $57000.